The J! 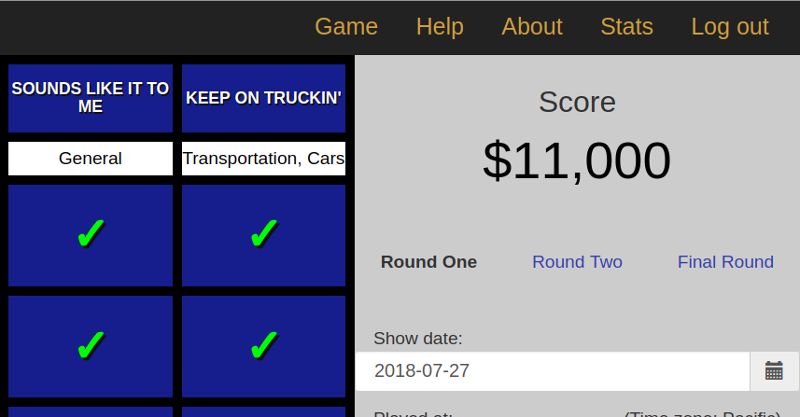 Scorer makes it easy for prospective Jeopardy! contestants to play along with the show and keep track of their training progress. The game page is where the action is. 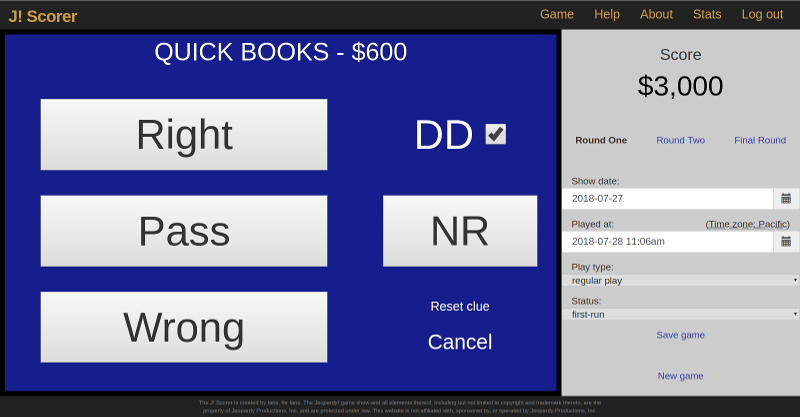 When a contestant selects a clue, click on (or touch) the appropriate box. This will bring up an overlay with several buttons. Click on Right or Wrong as appropriate for your response, or Pass if you chose to STAY CLAM. When a Daily Double is uncovered, tick the DD checkbox. The NR button is for any clues that go unrevealed. 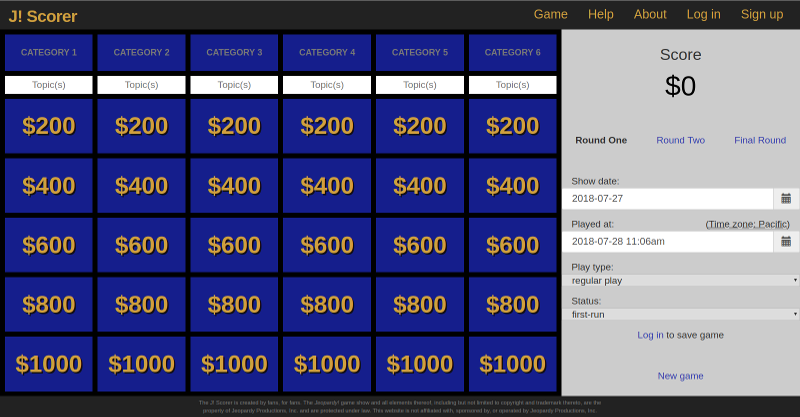 If you plan on saving your game, at the conclusion of each round, you can enter zero or more custom topics for each category in the white box between the category name and the clue boxes. (Separate multiple topics with commas.) After your game has been saved, your results from that category will be added to your totals for each topic on the stats page. Navigate between rounds with the links below the scoreboard. For the Final clue, the category and topic areas work as before. Use the large Right or Wrong button to record your result. A check mark or an X will appear next to your score, as appropriate. At the bottom of the Final area, there are places to enter the on-air contestants' results. 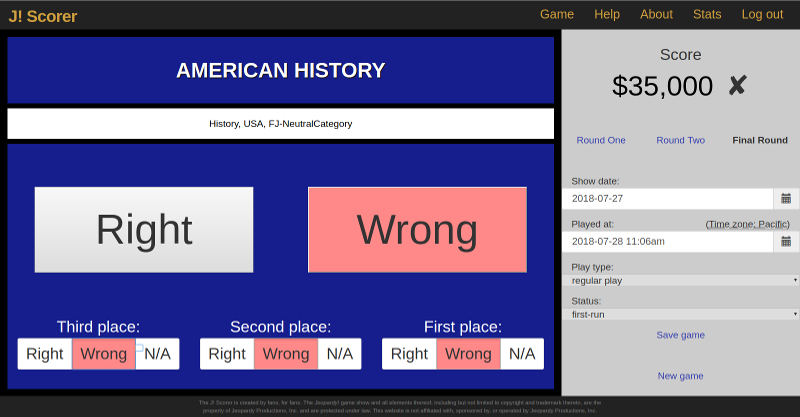 (Use their positions entering Final, i.e., just enter the results left-to-right, as third place is revealed first on the show.) This will enable you to view your Final stats broken down by contestant results, which can come in handy if you find yourself facing, say, Stratton's Dilemma. To save your game, make sure that the show date, date and time played, play type, and rerun status are correct, then click the Save game link. When the game is successfully saved, the text of the link will change accordingly. Happy playing! If you have any questions that aren't answered here (including the notes below), please email steve@j-scorer.com. A note on browsers: The J! Scorer is developed primarily for recent versions of Chromium/Google Chrome, with regular checks that it works reasonably well in recent versions of Firefox. Support for other browsers is not planned at this time. A note on mobile devices: In designing the J! Scorer, my decisions are aimed at maximum usability on laptops and desktops. Smaller-screened devices can work, but will likely need to be rotated so the screen is wider than it is tall.